Can't decide which flavor to choose? Do you need every flavor in your daily rotation? These sample packs have got you covered. 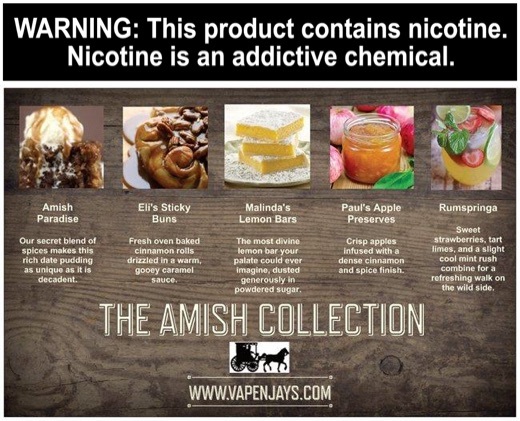 Enjoy all of the flavors from The Amish Collection in the bottle size of your choice for less! Amish Paradise was born from a secret family recipe handed down from generation to generation. This rich date pudding is a sweet decadent dessert flavor that is absolutely to die for! Gooey caramel drizzled over warm cinnamon rolls baked to perfection with our family's secret spices, Eli's Sticky Buns is the ultimate 'melt in your mouth' flavor. The lemon is a classic summer staple in the Amish kitchen. For generations our family has used this tangy fruit to create the most divine lemon bars your palate could possibly dream of and then we dust them in a sweet layer of powdered sugar. Apple preserves just like granny used to make. A sweet crisp apple sensation infused with a dense cinnamon and spice finish. Sweet strawberries, tart limes, and a slight cool mint rush combine for a refreshing walk on the wild side. By far some of the best flavors I've had. Amish Paradise and Paul's Apple preserve are my new all time favorites! Has a rich cinnamon flavor, nice spice and not overly sweet. I live in Amish county so I had high hopes and expectations for this line. It definitely delivered. I can't say that any will become my must have all the time juice but all were definitely good. I was most pleasantly surprised by the rumspringa. I don't care for mint/menthol flavors and thought it would be an instant giveaway. But I enjoy it and only passed it on after vaping half of it. Totally decent. I expected the most from the Amish Paradise. It delivered but soon I picked up on a coconut note that seemed to become more prominent as I went through the bottle. Overall, very satisfied, will very likely order more. Every flavor is spot on. Absolutely love them, even the flavors I didn't know if I would. Malinda's is hands down my favorite!